The Islamic finance industry has seen a rapid local and international growth in the past decade, with over 2500 Islamic banking branches employing graduates and executives all over Pakistan. The market size of Islamic banking assets is currently 12.9% of the total banking assets of Pakistan, and is expected to reach 20% by 2020. Hence, there is an increasing demand of professionals who have expertise in Islamic Banking and Finance. Every year, approximately 2500 additional trained Islamic banking executives are needed to support this growth. 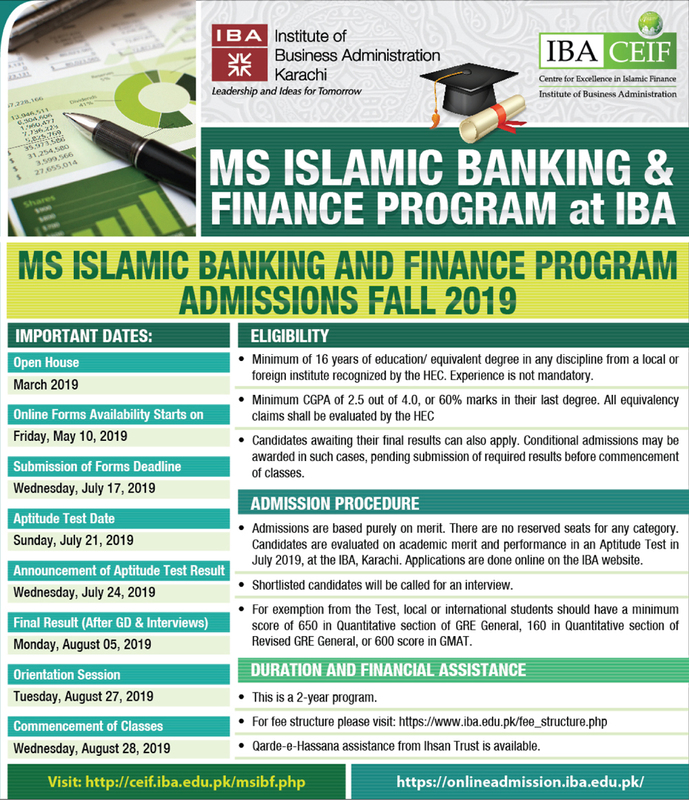 Realizing this need, the Institute of Business Administration (IBA) launched MS Islamic Banking and Finance in Spring 2017. Currently, 72 students from three batches are enrolled in the program. The program has been designed for fresh students, experienced industry practitioners and Shariah scholars. It will meet the growing needs of the Islamic finance industry by providing theoretical and applied knowledge of Islamic finance, Islamic jurisprudence, banking and economics. Graduates of the program will have very promising career prospects in academia and in the local and international Islamic finance industry. International students are highly encouraged to apply. Candidates must have a minimum of 16 years of education/ equivalent degree in any discipline from a local or foreign institute recognized by the HEC, with a minimum CGPA of 2.5 out of 4.0, or 60% marks in their last degree. All equivalency claims shall be evaluated by the HEC. Experience is not mandatory for this program. Candidates awaiting their final results can also apply. In such cases, conditional admissions may be awarded, pending submission of required results before commencement of classes in August 2019. Admissions to all programs at IBA are awarded purely on merit, and there are no reserved seats for any category. Candidates will be evaluated on their academic merit and performance in an Aptitude Test, to be held on 21st July 2019, at the IBA, Karachi. Applications are to be submitted online on the IBA website. The Aptitude test is a written test of English and Mathematics. To be exempted from the Test, international or local candidates should have a minimum score of 650 in the Quantitative section of GRE General, 160 in Quantitative section of Revised GRE General, or 600 score in GMAT. This is a two-year program. The maximum duration allowed is five years. Qard-e-Hassana assistance from Ihsan Trust is also available.